As the government investigates an unauthorized satellite launch, amateur trackers are watching the skies for clues. “Perfect timing!” Mike Coletta said when he answered the phone. I called him recently to ask about some satellites currently orbiting Earth. Just then, one of them was passing over his home in Colorado. Coletta has been tracking satellites with radio antennas mounted on his house for years. This spring, he’s on a special mission: He wants to catch the transmissions of “SpaceBees,” four satellites that were launched into space without permission. Last December, the Federal Communications Commission, the U.S. government agency that oversees satellite launches, explicitly told the California-based maker of these satellites that they couldn’t launch them. They did it anyway the following month, marking the first-known unauthorized launch of a commercial satellite in American history. This sets a dangerous precedent. The satellites’ makers appeared to have good intentions: to bring internet connectivity to people who might benefit from it. Other satellite operators may not—and we may find out too late. Coletta dug up the SpaceBees’ planned radio frequency in FCC documents. The satellites aren’t supposed to be transmitting. For weeks, he heard nothing. Then last week, he detected a signal as the satellites passed over him. A few days ago, he detected it again. It was sudden and short-lived, “kind of like a click of a microphone,” he said. The frequency of the signals matches the frequency the SpaceBees were designed to use. But there’s no way to know whether the satellites are the source. For Coletta, that’s part of the fun. He likes the mysteries best. And what a mystery this one is. The SpaceBee is a prototype satellite from Swarm Technologies, a start-up founded in 2016 and based in Los Altos, California. There is little publicly available information about Swarm. According to Mark Harris, the reporter at IEEE Spectrum who first broke the story about the satellites’ unauthorized launch, the company is in stealth mode, the term for the period of relative secrecy of a budding start-up and a popular Silicon Valley strategy. Most of what is known about Swarm comes from a handful of websites and public records, including correspondence between the company and the FCC. In 2016, Swarm applied for a grant from the National Science Foundation. The company’s pitch was to develop a satellite-based communications network for internet-connected devices, particularly in places without access to wireless networks. “Scientific, shipping, tracking, automotive, agriculture, energy, medical, educational, and other commercial entities will have the ability to return their data from anywhere on the planet to support tracking, safe operations, and optimal and timely decision making,” the company explained. In December 2016, the NSF awarded Swarm more than $220,000 as part of a funding program for small businesses. In April 2017, Swarm submitted an application to the FCC about a fleet of four tiny satellites called BEEs, for Basic Electronic Elements, and two internet-connected ground stations that would be used to transmit data back and forth. An illustration showed the satellites stacked on top of each other like coasters, each measuring 10 centimeters in length and width, and 2.8 centimeters in height. The satellites, Swarm said, would relay encrypted communications with the help of the ground stations. The company said it planned to buy a ride for the satellites on the Polar Satellite Launch Vehicle, India’s rocket launch system. The FCC came back with bad news. In a letter in December 2017, the agency denied Swarm’s request to launch and operate the satellites, citing safety concerns. According to the FCC, the SpaceBees were too small to be tracked by the U.S. Space Surveillance Network, a military-operated system that catalogs all artificial objects orbiting Earth. If the government can’t track satellites, it can’t protect them from colliding into other satellites. “We cannot conclude that a grant of this application is in the public interest,” wrote Anthony Serafini, the FCC’s experimental licensing branch chief. Swarm submitted an updated application on January 7, 2018. Five days later, India launched a rocket carrying dozens of small satellites from various countries. The launch inventory says four SpaceBees, made in the United States, were on board. Swarm, it appeared, had launched anyway. On March 7, Serafini sent an email to Swarm’s CEO, Sara Spangelo, saying the agency had begun an investigation of the company’s “apparent unauthorized launch.” Swarm’s applications for other operations were also put on hold, including a launch in April. A spokesperson for the U.S. Strategic Command’s Joint Functional Component Command for Space, which maintains the Space Surveillance Network, says the unit was able to spot the SpaceBees in orbit shortly after they launched. The satellites are too small to track, but not too small to be seen. And there’s no hiding from the military, says Scott Chapman, a satellite tracker who, like Coletta, has been following the SpaceBees with antennas on the roof of his home in Virginia. Aside from classified satellites, all objects launched into space get tracked and logged into databases that can be accessed online. So, what should be done about these SpaceBees? The FCC completed a “fact-finding inquiry” at the start of May, according to Neil Grace, an agency spokesman. The case is now with the agency’s enforcement bureau. Grace could not say whether a referral to the bureau means a penalty will be implemented. Because the unauthorized launch is a first, it’s not clear what the punishment would be. Spangelo, a former systems engineer at Google and NASA’s Jet Propulsion Laboratory, did not respond to calls or emails. Neither did others employed by or associated with Swarm, according to the company’s website and public documents. Space may be the final frontier, but it’s by no means a lawless one. Space is a largely peaceful area because nations have agreed, whether in treaties or through unspoken norms, to play by a shared set of rules. Transparency is paramount, even in some cases of military or national-security missions. For a private company to launch satellites into low-Earth orbit without approval from its government flouts the framework that makes an extremely dangerous environment a fairly safe place to be. But even small satellites can be a hazard. 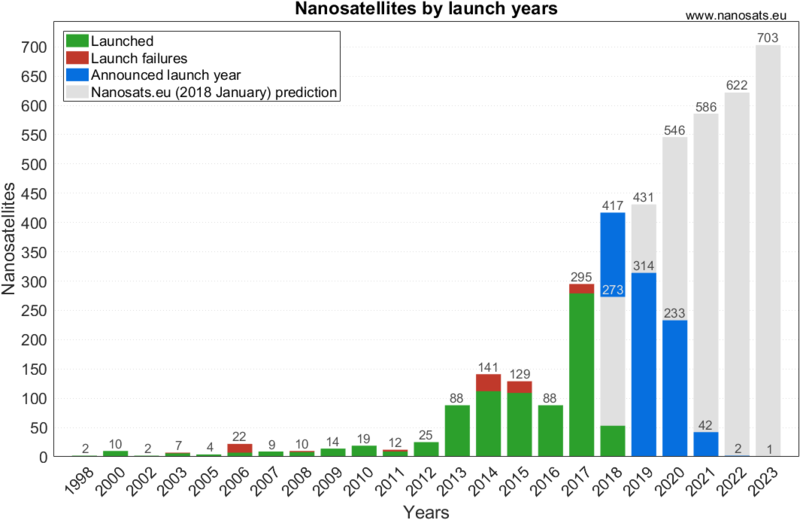 After 60 years of space exploration, low-Earth orbit has become a crowded place. It’s home to about 1,200 functioning satellites, 4,300 defunct ones, and 23,000 pieces of debris, according to the latest numbers from the European Space Agency. Collisions can occur, producing even more bits of floating junk. In 2009, two satellites from different countries knocked into each other and were destroyed. The collision sent hundreds of pieces of fast-moving hardware around the globe. “Even small objects, even things as small as these SpaceBees, traveling that quickly can really be destructive,” Rand says. If they hit something, “both India and the United States would be on the hook if one of these SpaceBees collides with a Russian satellite,” in accordance with international rules. As of April, there are 589 nanosatellites in orbit—satellites with masses between one kilogram and 10 kilograms (2.2 pounds to 22 pounds), according to a comprehensive database run by Erik Kulu, a spacecraft systems engineer in Glasgow. And many more are coming. Commercial companies like SpaceX want to launch fleets of hundreds, even thousands, of nanosatellites that would create constellations capable of supporting vast networks and bringing internet access to underserved places—just like Swarm wanted to do. If Swarm had waited a little longer to launch, its size may not have been an issue, Rand says. Lockheed Martin is currently building a radar system that would allow the Space Surveillance Network to track smaller objects than is possible now. The program is expected to be finished by the end of this year. “With a little patience, perhaps Swarm would have been able to safely move forward with their original small design in a responsible, approved, safe manner,” Rand says. There’s no way to remove rogue satellites from orbit. Start-ups aiming to develop space-debris-clearing technology are only a few years old and still raising money. According to information Swarm provided to the FCC, the SpaceBees have enough battery power to remain operational for up to 10 years. They will likely fall back down to Earth before that; the satellites are not equipped with propulsion systems, which means they don’t have engines to escape the pull of Earth’s gravity and maintain a stable orbit. Swarm’s application said the satellites will reenter the planet’s atmosphere and disintegrate in a little under eight years. Coletta and Chapman have no plans to stop tracking the rogue satellites. They’re both a ways away from Georgia and California, where the ground stations that can talk to the SpaceBees are located. But they know where the SpaceBees are and when they’ll be passing over their heads. They can point their antennas in their direction and listen. When I asked Grace, the FCC spokesman, about the brief signals Coletta has detected, he said he’d look into it. Swarm employees would know whether the pings came from the satellites, but they’re not talking. These mysterious signals aside, the SpaceBees have been orbiting in silence since they launched. If the FCC decides to clear Swarm, they may turn on and start buzzing. If the agency penalizes Swarm, with fines or bans on future work, the satellites will be sentenced to a lifetime of quietly circling Earth. They will float along with the rest of the space junk until gravity beckons and drags them back down, to the place they were never supposed to leave.